Julie and I have been putting in plenty of miles over the last few months training for the Transcontinental Race. We know that we’re not going to win it, but that’s not why we’re doing it. We’re doing it because it’ll be a massive adventure and a huge personal challenge for us both. With this in mind we’re aiming to try and get to the finish in Meteora within 16 to 18 days, before the final checkpoint officially closes, which means an average daily distance of 250 km a day. To try and maximise our daily cycling time we’ve decided to bivvy whenever and wherever conditions allow, sometimes in campsites but also just wherever there’s a comfy looking spot to get our heads down. This will enable us to cycle all day until we’re tired and then crash for a few hours without being too restricted. It’ll also help us to keep the cost down as staying in hotels for 18 nights could end up being pretty pricey. We’ve agreed that we’ll only stay in hotels if the weather is bad or when we need to wash kit, charge devices or have a desperate need for a bed! Although we’re both experienced campers and we don’t mind roughing it, neither of us have done much bivvying before. We needed to spend money on some quality, lightweight kit so we’ve spent a lot of time over the last few months looking at different kit and carriage options, borrowing kit from other people to try out, before forking out in order to make sure that we’ve got something that works for us and that we’re happy to drag around Europe for 18 days. 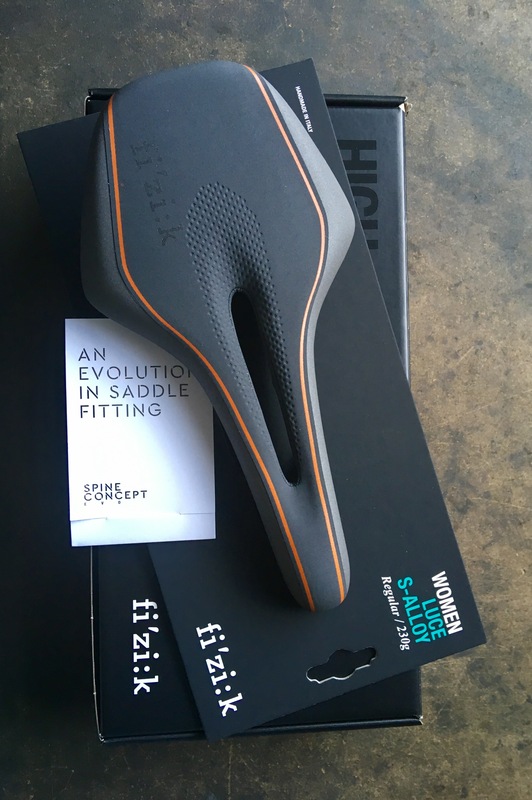 We’ve had a lot of invaluable help and advice, not to mention considerable discount, from Shona and Rich at Keep Pedalling in Manchester, Alex at Jagged Globe in Neepsend and Dan at the new Alpkit store in Hathersage. After wriggling around shop floors in a variety of different sleeping bags and bivvy combos, we’ve both ended up going for slightly different options; me with Rab and Apidura and Julie with Alpkit and Apidura. All bagged up and ready to go. Paris-Brest-Paris 2015. I’ve had my Apidura kit bags for a couple of years now as I first bought a small set to carry my kit on the PBP in 2015 and I just love ’em. Although they’re showerproof, I’ve splashed out on a new fully waterproof bar bag after learning the hard way last year when all of my clothing got very wet in three days continuous rain on a trip to the Outer Hebrides. The waterproof versions are a little bit heavier but as it’s going to house my my down sleeping bag it’s really important that I keep it dry and even though we’re going to central Europe in July, the likelihood of us staying dry for the full 18 days is slim. Bulk and weight were the premium considerations. My Sleeping bag is a Rab Neutrino 200 which weighs 580g and squashes down very small. It’s going to live inside my Bivvy – a Rab Ascent, weighing in at 625g – and will all get squashed into my bar bag along with my silk liner. Julie has opted for an Alpkit PipeDream 200 down bag weighing in at 545g, a Hunka Bivvy and Airlok Bar bag. Both of our bags have a hydrophobic down fill but we still want to try to keep them as dry as possible – a wet down bag is about as warm as a paper towel. Last weekend, cashing in on the sunny spell we’ve been having recently, we decided to have a three-day dry run with two overnight bivvy stops. We took an anti-clockwise triangular route, heading south of Sheffield to the Forest of Arden on day one, north-west to Lake Bala in Wales on day two and finally heading back over the Peak to Sheffield on day three. To make it slightly easier we opted to stay in campsites rather than camp wild. Originally we’d planned to ride over 200 km every day in order to try and emulate our expected TCR conditions and see how we’d cope with camp set-up when we’re tired. Normal life events conspired against us last week though and we had to set off a bit later than planned which meant trimming the first day down to 180km. Our route headed south through the Peak, past Carsington Water, toward Burton-on-Trent. Once we were out of the Peak the route was fairly flat and even though our bikes were loaded up we were able to keep to around 22km an hour without much trouble. Riverside cafe at Bewdley. Really great as long as you’re not in a hurry. The route was almost due south, although we made little detour to cycle through Meriden, the centre of England, which is a pleasant but fairly unremarkable little village. The most interesting discovery for us was the cyclists war memorial on the village green. It was really touching to see cyclists’ contribution recognised in this way and we wondered who’d paid for it to be erected and for its upkeep. Our final destination for the day was the the Island Meadow camp site in the village of Aston Cantlow and as we’d cut down the distance we ended up making good time and arriving just after 6.30 pm. We got ourselves booked in – a fiver each a night – and had the usual kinds of conversations that we have with ‘normal’ people in the camp shop: “Where did you set off?” – “What?! Today?” – “You’re cycling all the way to Wales tomorrow? !” – ” Are you mad? !” That kind of thing. The campsite had great facilities: free showers and a free hair dryer plus plenty of plugs in the washroom to charge devices. This wouldn’t normally be a problem for me as I have an Igaro USB charger that attaches to the dynamo on my front wheel but unfortunately a bit of it had broken off and it wouldn’t hold the charge so I was in need of plug points to charge up my Garmin. We washed out the kit we’d been wearing that day and used the hairdryer to dry it off a bit before heading off to the local pub for tea. The Kings Head was a quintessentially English country pub and restaurant with a rather fancy, but not particularly cyclist-oriented menu and slightly out of our price range for a budget bivvying weekend. The food coming out of the kitchen looked fabulous but we were after piles of carbs rather than fillet steak. There was, however, a childrens’ menu with pasta on it so I had a word with the waiter to see if they could possibly prepare us a large portion of the kids’ meal. We were in luck and the chef made us a lovely carb-rich dinner of pasta with a tomato and garlic sauce, focaccia bread and olives. Aston Cantlow adventures… Don’t worry, we didn’t sleep in the graveyard. Back at camp we set up our bivvys under a willow tree and were tucked up for 10.30pm. Both of our bivvys are big enough for us to put our sleeping mats inside. My Neoair XLite is very rustly and sounds a bit like I’m sleeping on a giant crisp packet but it’s very light and does the trick. Julie was out like a light but it was a warm evening so I stayed up for a while staring up at the sky and waiting for the sun to go down. 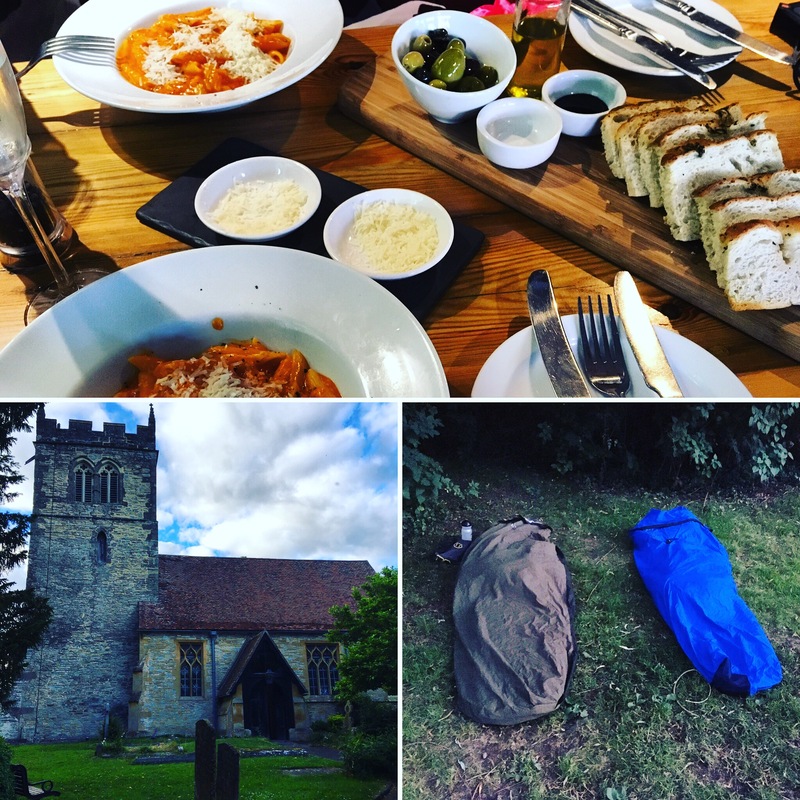 I contemplated whether I’d need to get into my sleeping bag at all and just sleep in the liner but I decided that I’d probably wake up cold in the middle of the night and got in it anyway, which was a good move in the end. Earplugs went in around 11 and I didn’t stir until 6.30 am the following morning – a bit later than we’d planned. After a quick pastry breakfast that we’d purchased from the campsite office the evening before, we were off for 7.45 am. We’d hoped to get away a bit earlier but my Garmin needed a bit more charge so I wasn’t rushing to leave. The roads were very quiet and we made good progress passing south of the Birmingham conurbation. 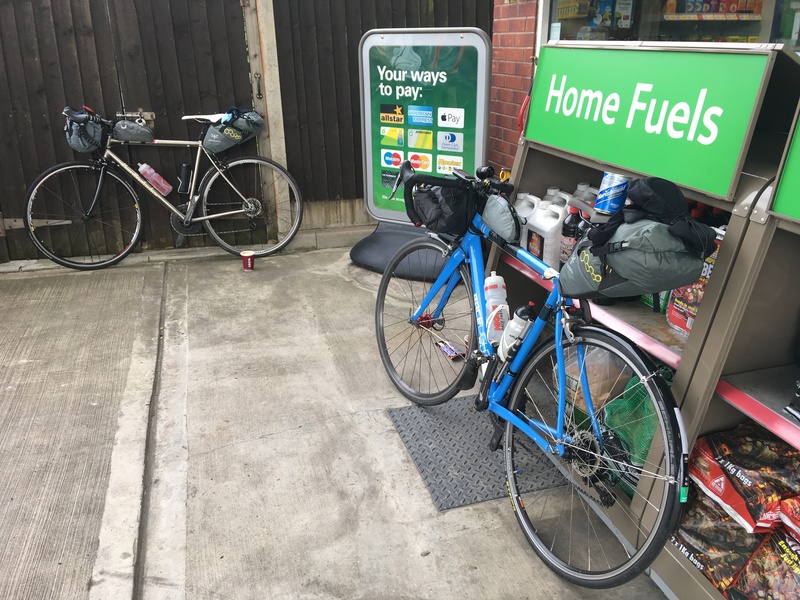 We had a quick 15 minute stop at a petrol station forecourt for a wake-up coffee before pressing on to Bewdley on the River Severn for our first proper sit-down stop. The cafe setting on the river was lovely but the queue was long and the service was slow and we ended up spending almost an hour waiting for our order. It was a popular spot with other cyclists and we had a few conversations while we were waiting but it made us realise just how much time can be wasted at cafe stops and decided that for the rest of the day we’d try to stick to shops for supplies in order to keep good time. 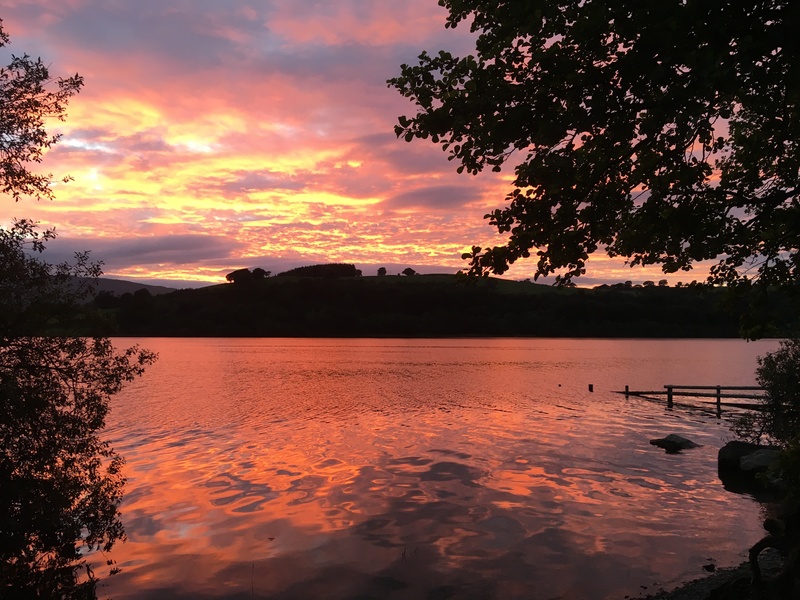 Today’s destination was Lake Bala in Wales at just over 200km and the biggest climbs at the end of the ride so we needed to try and keep on schedule to arrive at the campsite for 8 pm. 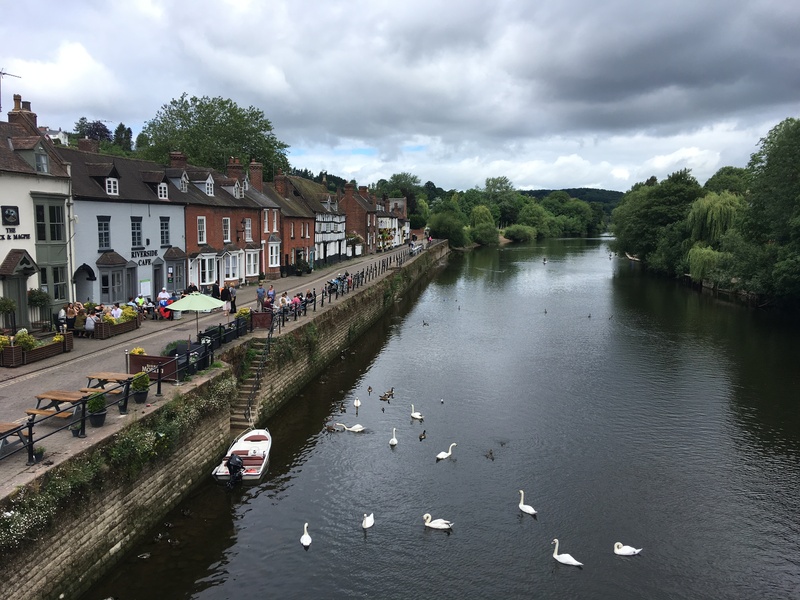 From Bewdley the route took us into the Shropshire hills, over Wenlock Edge, skirting past the edges of Shrewsbury and through Welshpool. We arrived on the outskirts of Shrewsbury around 2 pm and were expecting that we’d find a village shop somewhere on route but none materialised. By 3 pm we’d run out of snacks, were both starving and still had around another 20km to go until Welshpool, so when we passed a pub in Yockleton that was still serving food we piled in. The cheapest thing on the menu was a tenner but there weren’t many customers so we were hoping that we’d get served quickly and on our way. While we waited we’d spied two plugpoints in the corner so we took the opportunity to get some more charging done. The hope of a quick turnaround didn’t materialise and 25 minutes later, despite only one other table of customers, our food had still not arrived. We both stared hard at the waitress, sending out super-hungry vibes and finally, 35 minutes after walking in, we got our meals. 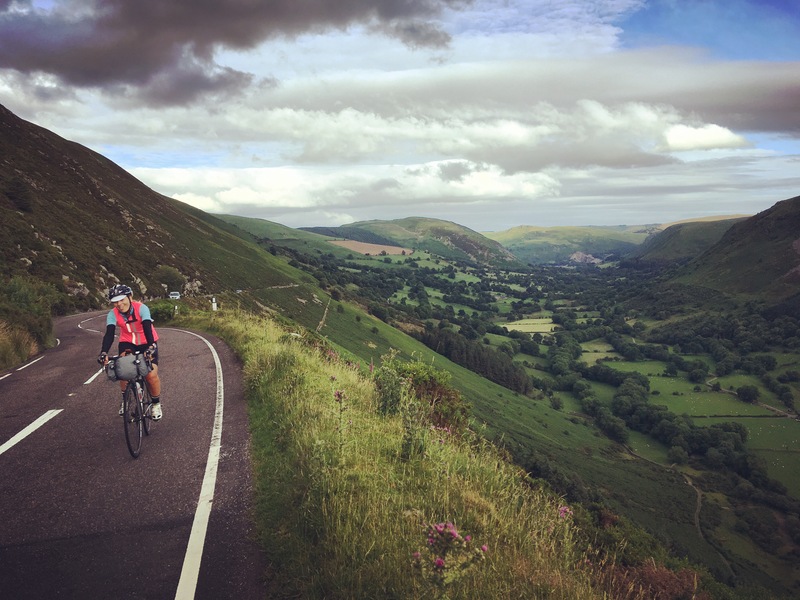 Both were substantial and tasty but by the time we’d eaten, another hour had gone by and we still had 80 km to cycle – through Wales, up a very big hill, with no snacks. Our 20 km to Welshpool was tough. We’d taken the singletrack roads up and over a very big hill with a steep descent and also manage to fit in in a brush with death as the driver of a 4 x 4 coming in the opposite direction decided the he wasn’t going to bother slowing down, or even attempt to move slightly out of the way to pass us, preferring instead to run us both off the road into a gravel bank. We were both pretty shook up and had to stop for a few minutes to calm down. Selfish idiot – I really wonder what goes on in people’s head’s to make them think that’s an acceptable way to treat another human being. Welshpool was shut when we got there, save for a convenience store, so we had to make do with packet tuna sandwiches, yoghurt and a packet of crisps for the evening’s tea, all stuffed into our saddlebags for consumption at the campsite later. From Welshpool we were supposed to be taking minor roads over to Penybontfawr but the main road was quiet enough and would save us some time, event though it would cut some mileage off the route. After Penybontfawr the route began to steadily climb over the Burwens. It’s not steep, just steady, but it’s a long one. As we climbed could see the road cut into the hillside, stretched out like a ribbon in front of us to the head of the valley. The views across the valley were spectacular but we were both pretty knackered by now and just wanted to get down the other side. We also had a lot of of daft sheep to negotiate with and no matter how much room we gave them, they were still startled, dashing in front of us at the last minute, but at least we were climbing rather than descending. Eventually we made it to the top and stopped to layer up before our descent to Bala. We accidentally managed to herd another five sheep into the path of an oncoming Range Rover on the way down but luckily for all involved he was a little more courteous than the previous 4 x 4 driver we’d encountered and saw the funny side. We eventually made it to the campsite for 8.30 pm where, after hearing of our epic day (only 195 km though) the warden took pity on us and made us both a nice cup of tea. The campiste at Bala has a prime lakeside spot so it was a bit more pricey than the previous night’s at £9 each. Showers were 50 pence for 8 minutes (more than long enough) but there were no plug points in the showers so we had to use Julie’s big power brick to charge up all of our devices. We’d been saving it for emergencies but I guess, with no plug points to be had, this was that kind of an emergency. The camp facilities were very modern and clean though and the super-friendly warden offered to get up early at 6.30 am to make us another cup of tea so you couldn’t say fairer than that. By the time we’d got our bivvys set up and ourselves showered, the sun was beginning to set over the lake. I sat and ate my packet tuna sandwiches, having a paddle and watching the sun go down. This really was a beautiful spot to spend an evening and a few fellow campers were having open fires on the lakeshore. 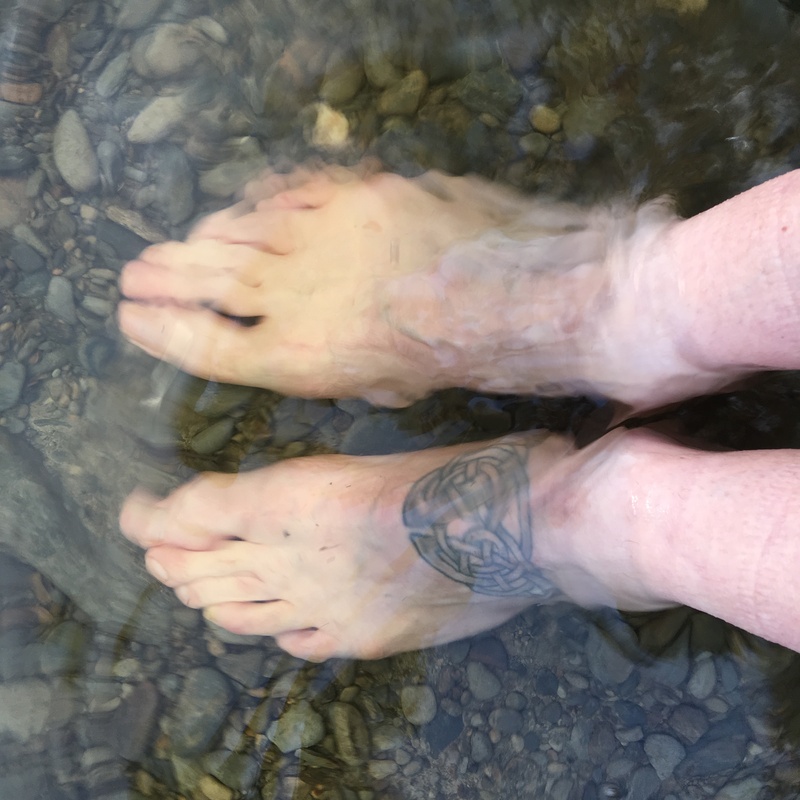 However, with lakes come midges – lots of ’em. I’m very lucky that I don’t react much to midge bites but they’re still annoying little critters and soon enough I was starting to feel a bit like that character from Charlie Brown who always has flies swarming around his head. The warden was selling bottles of Skin So Soft in the camp shop but we really didn’t need to buy another thing to carry and decided to just put up with them. Julie had brought along her little mozzie headnet to wear as her bivvy has an open face so she needs to wear it while sleeping. My bivvy has a built-in zip-out mesh panel that allows ventilation while keeping the midges out but I’m sure a few of them sneaked in there with me. There’d be no ‘out-of-the-bag, gazing up at the stars’ moments happening tonight. We both woke up at 6 am – and cold. It hadn’t rained in the night but everything was very damp and we’d both woken up feeling too cold around 4am, before layering up and trying to get a bit more sleep. I had a couple of little slugs on the outside of my bivvy – maybe they’d mistaken me for giant slug and had come along to make friends – needless to say I was glad of my mesh ventilation panel again. True to her word, the warden got up to make us a cuppa before we left and, after getting packed up, we were back on the road in search of breakfast just after 7am. Thanks to Sheffield CTC’s residential weekends to Llangollen I’ve spent quite a bit of time on my bike around this bit of Wales and I was armed with prior knowledge of good cafe stops, so we headed the 10 or so miles to Corwen on the back roads for a fry-up. Originally we’d planned to ride the 200km back to Sheffield today, but I needed to get my Igaro charger fixed at Keep Pedalling and as the route went to close to Manchester it seemed more sensible to head there and get that sorted out as a priority. This little trip had demonstrated how much I’ve come to rely on it for getting everything charged up when I’m on the move and I needed to make sure I had it repaired in time for the TCR. After a fairly leisurely breakfast we headed off north-east in the direction of Chester. We’d decided to try to cut out as many of the main roads as possible as we were a bit worried about Monday morning traffic but the minor roads were very hilly and poorly surfaced so we decided to drop back down on to the main road at Lllandegla and just put up with the cars. After another little detour up a really steep single track hill at Coed Talon we crossed the border back into England and the roads flattened out towards Chester. Chester lunch stop. Great view but it cost us quite a lot. We arrived in Chester at lunchtime and had an overpriced lunch in a cafe by the river, but at least the service was quick and we were on our way within 40 minutes. 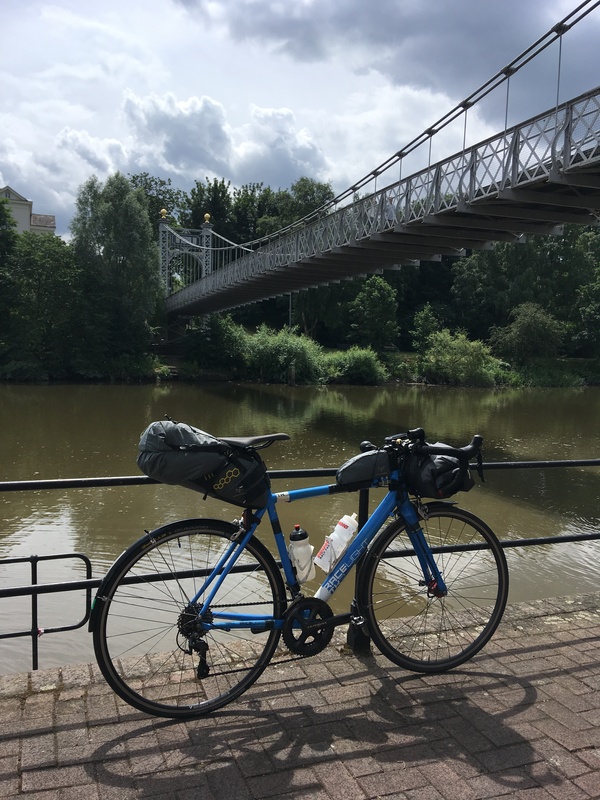 Our route through Cheshire took us along the Whitegate Way cycle track to Winsford and over the River Weaver by the salt mines on the Sustrans trail. The track here is very poorly surfaced and I ended up with a rear wheel pinch puncture which meant taking all the kit of the back of my bike and stalled us by 15 minutes. We needed to get into the centre of Manchester before 6 pm and I was keen to avoid hitting the outskirts at rush hour. We’d also detoured from our planned GPS route and were navigating our way by memory and road atlas maps which slowed us down even more. By 4.30 pm we were already stuck in horrendous traffic in Wilmslow. It had taken us over ten minutes to get through three sets of traffic lights and I was worried that we wouldn’t make it. Even though it was only 13 miles into the city centre, I didn’t want to chance it and miss my opportunity to get the Igaro repaired so we decided to call it a day and jump on the train to Piccadilly. 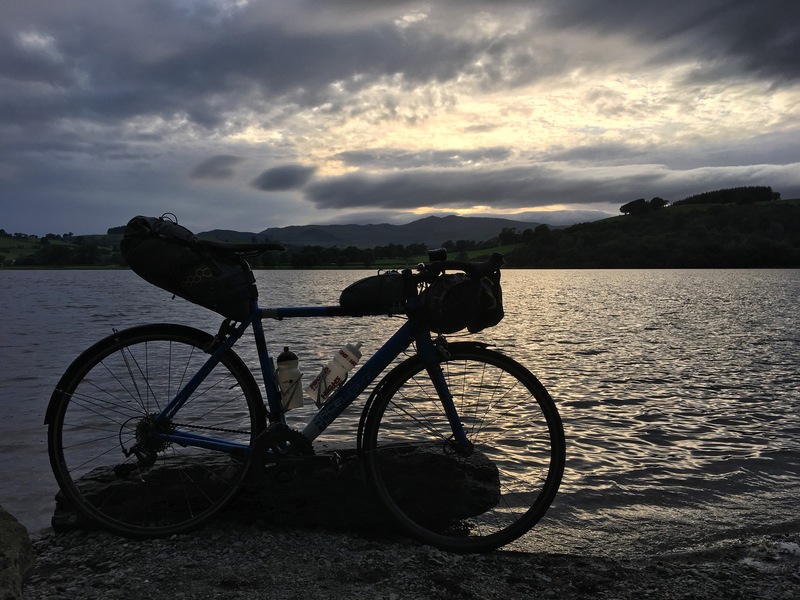 We made it to Keep Pedalling in good time, device handed over for repair and we had time to catch up with Shona and hear tales of their recent short-lived exploits on the Highland Trail 550. Julie’s heading off to France next Sunday so this weekend was our last training ride together before we meet up again in Belgium a couple of day’s before the TCR. On our final day we’d ridden 50 miles less than we’d planned to but the overall aim of the weekend had been achieved. Our kit had been tested, strategies discussed and we both now knew how it felt to spend a long day in the saddle after a night’s kip in a field. The next ride we start together will be on the Muur in Geraardsbergen on July 28th and I think we’re as ready as were ever going to be. Bring on the adventure.